Once in a while I’ll receive a question in the Quiet Speculation Insider Discord chat about my selling patterns. This usually occurs after I report a sale I made via Twitter or Facebook—someone will be curious to know how frequently I sell on those venues versus a more traditional website like eBay or TCGplayer (though recall I don’t sell on TCGplayer at all). While I did have some peak periods last year during the Reserved List and Alpha boom, I tend to do the majority of my selling to buylists. It’s not optimal from the standpoint of grinding out every cent I can from my cards, but it’s often worth this inefficiency to save on time. It’s efficient for me to ship a bunch of cards all at once, and I often get impatient waiting for my cards to sell with eBay listings. With a buylist the sale is guaranteed and immediate. This frees up my resources to make the next acquisition. As I mentioned before, I submitted 47 unique buylist orders to Card Kingdom last year, averaging nearly one per week. This should showcase how often I rely on the buylist to move my cards and keep my portfolio fluid. Depending on my cash balance at the time, I sometimes choose to receive payment as a check and sometimes credit. Credit is normally the better value, but when my funds are low I may consider taking a check to give me more liquidity with which to do my buying. Between the 47 buylist orders, 29 of them were for store credit and 18 were for cash. The total value of all 47 buylists was $3498.55, meaning the average order was $74.44. In retrospect, this seems like a reasonable value for an average buylist order, being sufficient to justify my shipping costs. If each package averages about $3 for shipping materials and postage, then my total buylisting shipping costs was $141, or about 4% of my total buylisting value for the year. That’s a decent rate I’m willing to accept. You would think that my average store credit buylist order would be more valuable than my average cash buylist order by about 30%, due to Card Kingdom’s 30% trade credit bonus. And if my buylist orders were categorized randomly between the two options, you’d be correct. But they’re not. I tended to ask for credit more often if the value of my buylist order was relatively low. This way I felt like I could stretch the value of the trade-in a little bit further. Conversely if the buylist order was substantial, then I was more motivated in taking the cash. Therefore, the average buylist value of my store credit orders and cash orders was $60.10 and $95.56, respectively. With this much data, it has become quite interesting to run these analyses. But let’s take a deeper dive now to see how I did on some of the orders themselves. The most expensive buylist order I shipped to Card Kingdom in 2018 was for $255.25, a cash order, made on June 30th. Let’s see what was in that order and how much I received for each card. Below I will list the cash I received for each card and then what the card would net me today from Card Kingdom in parentheses. Other than the Strip Mines, it looks like my timing on this buylist submission was very good. If I had kept all of these cards instead of selling them to Card Kingdom, their total buylist value would be $120.25 less! I love my Old School cards, but when prices became too wacky and got ahead of themselves last summer, I knew I had to be opportunistic. This transaction perfectly captures why, and I suspect many of my buylist orders last summer will look similar. Next, let’s run a similar analysis on my very first buylist order of 2018, made on January 2nd (I didn’t waste much time, did I?). This was also a buylist order for cash, totaling $101.39. When Unstable was announced and silver-bordered cards were made Commander-legal for a brief moment, there was some speculative buying on Unhinged and Unglued cards. In this buylist order, it looks like I was clearing out some of the small stuff I had remaining. I also have a small bulk box from a Modern Masters 2015 booster box I opened when the set was new—every once in a while Card Kingdom throws a random common from that set on their buylist and I dig for those nickels. But clearly the headliner from this order is the Ifh-Biff Efreet. This card moved wildly throughout 2018 and speculators moved in and out again. It looks like my timing on this sale was reasonable, although I don’t think the buylist peaked at $95. It’s also worth noting that MTG Seattle pays more than $95 today, though I don’t have much experience selling to them. This buylist order contains cards that fit three categories. Category one is my Old School pile, consisting of nearly unplayable Antiquities and Legends cards that spiked for speculative reasons. 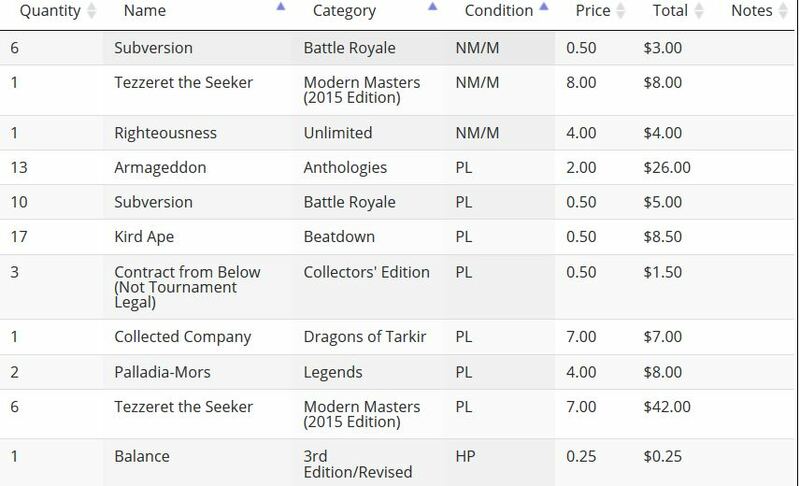 Obelisk of Undoing, Voodoo Doll, and Rebirth all buylist to Card Kingdom for less today than they did back in February, so these were great moves. Again, other stores may pay more for these cards but I have limited experiences selling to them. Category two consists of my bulk. I have a modest amount, but once in a while I dig through and find a bunch of nickels to ship to Card Kingdom. I figure the incremental cost of doing this is minimal in terms of shipping expenses; it only costs time. But given how much I enjoy sifting for nickels (it’s relaxing to me), I don’t mind the time sink one bit. It looks like I shipped 36 bulk cards in this order—that’s another couple bucks in credit from cards that are rotting in my bulk box! Category three consists of one card—another one of those Un-set speculations of mine. This time it was a foil Letter Bomb, which buylisted for $9.60 back in February but would fetch $16.50 today. Clearly that’s one I should have kept. This was an all gold-bordered buylist order. Selling these cards to Card Kingdom today would net $2.50 per Glimmervoid, $4.00 per Grim Monolith, and $5.00 per Mystical Tutor. Since this buylist order was placed so recently, in late December, it’s possible that my submission impacted their current buy numbers. So making the comparison is unfair. But the key to this buylist order is that I bought all of these cards from Star City Games, using cash, and sold them directly to Card Kingdom for a small profit. My return was probably only about 10% after accounting for shipping, but I’ll take a 10% return with one week turnaround and near-zero risk any day of the week! Where do I most often sell my cards? It has to be to buylists! In total, I placed 47 buylist orders to Card Kingdom alone. The convenience and ability to cash out of cards so quickly is just too tempting to pass up. What’s more, by timing my buylists correctly I can often make more money selling right away rather than sitting on cards long-term. Things don’t always work that way of course, but I’m pretty satisfied with the decisions I made in 2018 when taken in aggregate. Oh by the way, last year I made another 31 buylist orders to ABUGames, 10 for checks and the other 21 for credit. I wish I could analyze those buylist orders as I think they’d look quite different and be very interesting. I had a stack of Alpha commons and uncommons I shipped off to ABUGames when their buylist went crazy last year. But for now, I can’t view the details of that history on ABUGames’s website. Perhaps that feature will come in 2019! As for other vendors, I have no recent experiences to share. I haven’t sold to Star City Games’s buylist since February 16th, 2017—nearly two years ago! For kicks, here it is! I wish I could have that Unlimited Righteousness back, but my biggest regret is selling those two Legends Palladia-Mors. Oh well, at least I cashed out of those Tezzeret the Seekers, which haven’t done much in price since I submitted this buylist. It looks like this order was for store credit and probably reflects my store credit flipping days. I suspect I got those Anthologies Armageddons, Battle Royale Subversions, and Beatdown Kird Apes from a different vendor and I was flipping them for more store credit. Yet another utility of the buylist! As you can see, I love shipping to buylists and I leverage them very often for numerous purposes. But at the end of the day, it all comes down to trying to out cards quickly for a reasonable numbers so that I can rinse and repeat. Here’s to another 47 buylist orders to Card Kingdom in 2019! Look what’s back on Card Kingdom’s hotlist: The Tabernacle at Pendrell Vale. I watched that card’s buy price drop all the way down to $1200 or so on Card Kingdom’s website and now it’s back up to $1680. I’m telling you, Old School stuff is going to stabilize in 2019 and the most desirable cards—especially Legacy-playable ones—will see a rebound. Gaea’s Cradle spiked like crazy in 2018 and then dropped back down to earth as vendors ended up with more stock than they wanted. Card Kingdom was also in that boat, though I see the card is back on their hotlist with a $235 buy price. I’m going to watch this one closely because I expect this one to rebound steadily in 2019 as well. While I don’t see the Revised Dual Lands on Card Kingdom’s hotlist, I see they still have a few Collectors’ Edition duals listed. And recently they added another one: CE Tropical Island, at $165. These really went crazy in 2018 and it looks like demand for them is still strong. I’d watch these closely throughout 2019 as well!